It has been just under 12 months since Dad and I purchased a 610C with a 115 Yamaha four stroke. We fish out of Port Lincoln in South Australia. The weather never seems to be perfect and the Bar Crusher certainly earns its keep getting us to our fishing destinations. On an average trip we would cover between 50 and 70 nautical miles and the bigger days between 100-150 nautical miles. The boat handles a dream and is soft riding every time. The checkerplate floor is easy to clean – especially with a southern bluefin tuna onboard, which can be messy once bled. Everything from the automatic anchor winch to the deck wash works a treat; all the smaller things that go into a Bar Crusher makes all the difference. An excellent safe and soft ride with the added benefit of the extra stability at rest via the water ballast cavity. 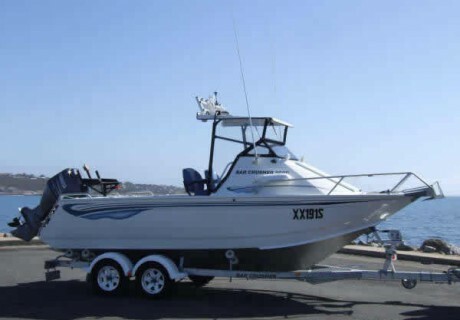 An excellent offshore boat, we are looking forward to many more years in the mighty Bar Crusher.